I tried about an hour ago and it all when through just fine... the only bottleneck was when the web form was consulting AT&T's servers to find my current plan and associated options. I also received my confirmation email shortly after. Maybe on the 24th, when you go in you might be able to pick up a white model instead of your pre-ordered black. Hahaha, nice. Black IS the new black. I commentedon Chris Pirillio's site earlier and just posted an additional comment which is awaiting moderation. I'll post my comment here as well as it is relevant. 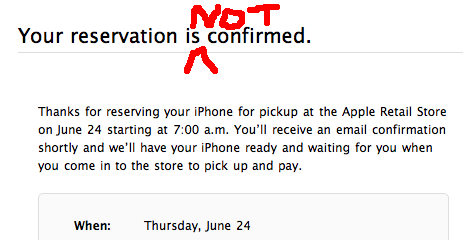 Chris, I just went back to Apple's iPhone 4 pre-order page to help a friend make a reservation and pick-up is no longer an option. It seems the online Apple Store has sold out of their allotment of reservations for same-day pick up. I believe the verbiage for pre-orders has changed as well and that Apple is no longer guaranteeing same-day delivery on the 24th when the iPhone 4 is officially released. It does state that you can come to a store and pick up an iPhone 4 on a first-come first-served basis (limit of 2) starting at 7:00 a.m. on the 24th. Which means they have an allotted amount of units set aside for sale. As the official pre-order date is the 18th it is conceivable that only a fraction of units have been delivered and accounted for. If another shipment of iPhone 4 arrives on the 18th pre-orders may resume... until they sell out again later that day. If that's all there is and they are sold out then what happened to the official pre-order date? Why did the system go live three days early? And what happened to white!? I predict lines... first generation iPhone length lines... mean resentful lines... and I shall hold my head up high.